Cities and their emergency responders will soon have a new way to deploy gunshot detection technology and be able to respond to incidents and react faster to protect their residents. A memorandum of understanding (MOU) between GE Lighting and SST, Inc., developer of the ShotSpotter™ crime detection and location suite, lays ground to embedding sophisticated ShotSpotter technology into GE’s intelligent LED street lights. ShotSpotter is already driving meaningful outcomes in cities today. Embedding the technology in GE's Intelligent Environments for Cities solution will take its benefits one step further by building into a city's existing infrastructure and by leveraging the GE Predix cloud. With ShotSpotter sensors embedded into lighting fixtures throughout a city, much broader coverage areas will be available on a cost-affordable basis. "We've entered an era where lighting is so much more than illumination," says Rick Freeman, Global Product General Manager, Intelligent Devices, GE Lighting. "The ecosystem we are building with our Intelligent Environments for Cities solution is transforming street lighting into the analytical brain of urban life, and this MOU with ShotSpotter gives one more option for cities to unlock new potential benefits for their city teams and their residents." "ShotSpotter is a proven tool in helping cities across the country address chronic gun violence issues," says Ralph A. Clark, President and CEO of SST, Inc. "The City of San Francisco, for example, reports an approximate 50% decrease in recorded firearms violence since deploying ShotSpotter as part of their gun violence abatement strategy. This partnership with GE will accelerate the adoption of this technology in other cities by integrating our solution into existing infrastructure in a more comprehensive way." In addition to the MOU with ShotSpotter, the future potential opportunities within GE's Intelligent Environments for Cities solution are nearly endless. For instance, parking downtown may be a pain, but not in the intelligent city of the future. 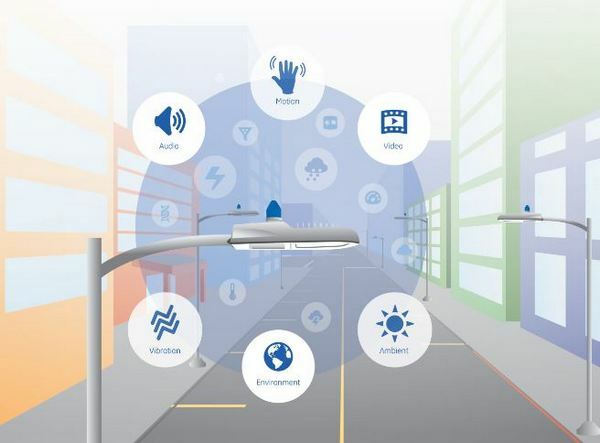 Networked LED street lights will have the ability to direct drivers to available spaces with the help of built-in sensors and wireless transceivers. The same streetlight could serve as a sensor and give warnings in the event of severe weather or other event or help manage traffic and offer residents a faster route home. To learn more about GE Lighting's Intelligent Environments for Cities solution, visit www.gelighting.com/intelligentcities. To learn more about ShotSpotter, visit www.shotspotter.com.